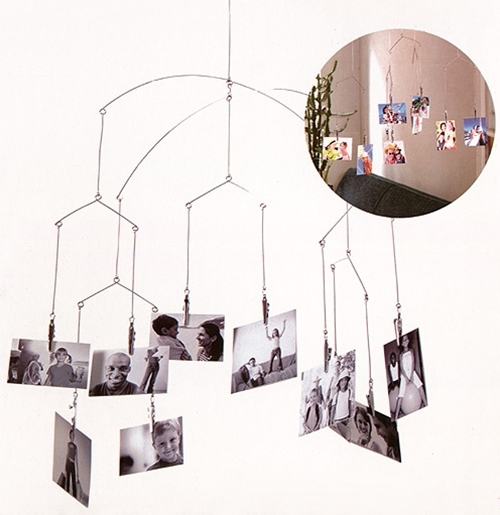 The Original Photo Clip Mobile - This ingenious mobile allows you to create your own unique work of hanging art! Simply clip your photos onto the ends of each wire using the pre-attached clips. The entire mobile comes assembled and ready to decorate! Let your imagination go- you can clip just about anything that is lightweight onto this mobile (such as decorative papers, leaves, and small ornaments) to create your own design. Made of light stainless steel. To give an idea of scale, the two largest wires on the mobile measure approximately 12 inches long.